Did you know? New York State is the second largest producer of maple syrup in the United States after Vermont, and the Sugar Maple is the state tree of New York. The Adirondacks with its rich forests and long history of agriculture is brimming with maple sugar houses and farms. Late winter into early spring is the ideal time to check out maple events happening throughout the Adirondacks, where you can learn all about the fascinating history of this industry, and sample delicious maple treats. 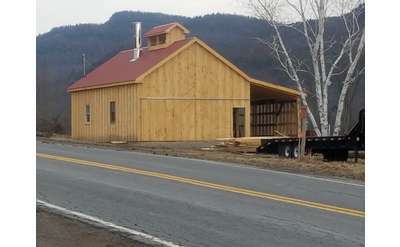 While you can purchase New York maple products all year round, March and early April offer a remarkable amount of events that allow you to tour maple sugar shacks and try sugaring first-hand. During Maple Weekends, maple producers welcome visitors and families to see how their products are made. Head to local maple farms and sugar houses to see production from start to finish, enjoy maple treats, and participate in this wonderful part of Adirondack history. Located in Fort Ann, NY, Battlehill Maple is one of Washington County's top maple producers, offering maple syrup, maple cream, and additional products. In the northern United States, the Native Americans were the first to harvest the maple sap for nutritional use. 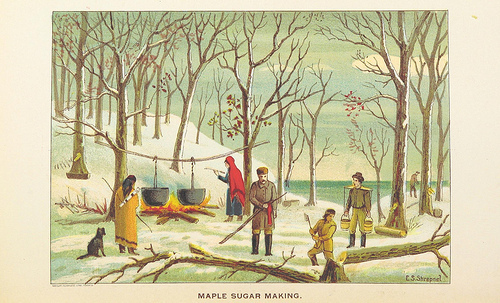 Before the arrival of European settlers in the 1600's, many tribes had a long tradition of producing maple sugar. The Algonquins used stone tools to tap maple trees and harvest the energy-giving sugar from the tree. They would cook the maple sap by placing hot stones directly into collecting buckets. The Algonquins would leave the buckets out at night and remove the frozen layer of ice that would form on top of the sap, a process similar to evaporating the excess liquid. The Iroquois also boiled maple sap from trees to convert it into maple syrup. In the 17th century, European colonists took advantage of the maple sap. At the time, the boiling process was time-consuming as the sap had to be transported by horses and oxen to a single location. Once it arrived there, the sugar was boiled and then processed over a fire built in the sugar shack. During the Civil War, advances in food storage, like the tin can, made it possible to sell and distribute maple syrup on a larger scale. Dairy farmers made maple syrup to supplement their income through the spring. Maple syrup was also promoted as an alternative to slave-produced cane sugar among abolitionists and northern advocates. The maple syrup production process went fairly unchanged until the energy crisis of the 1970's. Since then, the tapping and boiling processes have advanced, allowing for both more efficient and safer syrup production. With the use of modern filtration, vacuum pumps, reverse-osmosis techniques, and fast heating capabilities, the maple syrup-making process has never been more efficient. 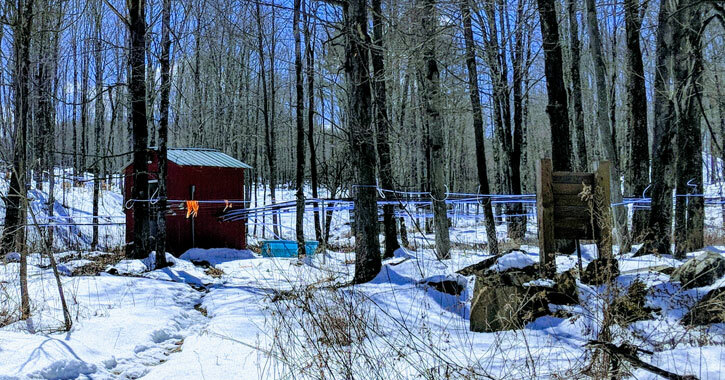 The process of maple sugaring usually begins in the Adirondacks in March before the Spring Equinox as the snow and ice begin to thaw. The Sugar Maple tree, or sugar bush, produces a sap that begins to flow depending on the temperature fluctuations between night and day. Maple sap has a high sugar content during the winter because cold periods below 25° F result in the conversion of starch to sucrose (aka sugar) which is required for leaf expansion. March is sugaring season because the warm daytime temperatures and freezing nights generate sap flow. The highest quality sap flows at the beginning of the season and has the highest sugar content. The process of collecting maple sap in the United States has advanced since the Colonial Era through the use of vacuum pumps and tubing. A maple tree is tapped when it is at least 30 years old and can support up to 3 taps. The tap allows the sap to flow into a collection area, either through plastic tubing that leads directly to the evaporator house, or into traditional buckets. Maple sap is nearly 98% water. This means that although a maple tree can produce more than 3 gallons of sap per day, it takes over 40 gallons of sap to produce just 1 gallon of pure maple syrup. Once enough sap has been collected, it is transferred to an evaporator in a sugar shack. A sugar shack or sugar house is a cabin-like structure that is louvered, meaning it has horizontal slats angled to let out the steam from the sap evaporation. The sap is heated and the excess moisture evaporates, concentrating the sugar in the sap. Boiling maple sugar is a highly controlled process to ensure that there is an appropriate amount of sugar in the product. Around 66-67% sugar content is ideal for high quality syrups. After boiling, the syrup is filtered, assigned a grade, and packaged. To create maple candies or taffies, the syrup is heated longer and combined with other ingredients.